Hello again, Don Milne here, your ROADTRIP-'62 ™ traveler. On this, the first of our ROADTRIP-'62 ™ routes, we'll be traveling US-23. We're at Rogers City, Michigan, one day out of the northern beginning point at Mackinaw City. We'll be heading south, using the roads of 1962. The next freeway is still about 140 miles away. I'll be driving on this virtual roadtrip, but if you see anything you like, I encourage you to get out on the road and enjoy it in person. This virtual roadtrip may be fun, but there's nothing like the real thing! At any time, click on an underlined word below to learn more about the places on the trip. Now, let's buckle up and go! Time to grab breakfast before we leave town. We can't go for a McMuffin because the McDonald's wasn't here in 1962. We can, however, get a full breakfast at our choice of the Lighthouse Restaurant, Kortman's, or Rooster Tail, all of which appear to date back to somewhere around 1962. I need to check that further and I will post what I discover. We'll drive past the quarry again on our way out of town, then head inland away from Lake Huron for about 15 miles. At the north end of Grand Lake, we turn onto County Road 638 to drive out to the Old Presque Isle Light. There are 4 light houses in the Presque Isle area, all old, so you lighthouse buffs can probably just stay here all day! The Old Presque Isle Light was constructed in 1840 and has been operated as a museum since the 1940s, with a light installed in 1957, so we can go visit that. The New Presque Isle Light replaced the old one in 1871 and was operated into the 1970s, so we wouldn't have stopped there. However, today it is also a museum. Back to US-23 from the lighthouses, and then we continue along the shores of two smaller lakes, to the ghost town of Bell. This is now the Besser Natural Area and has a 1-mile foot trail through the remains of an abandoned 1880s logging village. Though the trail was not here in 1962, you could have wandered around on your own if you knew where to find it. Now you do. Besides the ruins, the area contains a stand of mature, virgin red and white pine and over 4,000 feet of Lake Huron shore. Going back out to US-23 again, we next come to Alpena, Michigan, the largest city in this northern part of Michigan. It's an old lumbering town, and still had at least one paper mill operating in 1962. The Fletcher Paper Mill operated from 1897 to 2000. The site of the former Fletcher Paper Mill is now being redeveloped as a convention center, brew pub, and condominiums. Cement manufacturing, with another large limestone quarry just outside of town, became important in the 20th century. At one time, likely in the 1960s, Alpena was the world's largest producer of cement! One of the more unusual sights along US-23 is actually under water! Out in Thunder Bay off Alpena are over 150 shipwrecks, preserved by the cold freshwater of Lake Huron. Today the 448 square-mile Thunder Bay National Marine Sanctuary is here, and there are diving tours for all skill levels and even glass-bottom boat tours. In 1962 you had to get some scuba equipment and go diving on your own, but the wrecks were definitely there to see. Some of these are almost 200 years old, as the rocky shoals of Thunder Bay have been claiming ships ever since the days of fur trading and lumbering. The shoals are the reason for all the lighthouses in the area. I'm sure there was a lot of amateur interest in diving to the wrecks in 1962, as the popular television show Sea Hunt had just concluded a 4-year run. It made Beau and Jeff Bridges' father, Lloyd, famous and was the only show I can remember that ever focused on diving: both deep sea and scuba. I haven't tried a dive myself, but you can arrange a dive at places like Thunder Bay Scuba in Alpena. Or, you can see some shipwreck information on dry land today, and that's what I'm doing. The Thunder Bay National Marine Sanctuary has a new visitor's center, featuring shipwreck exhibits. I couldn't have seen this in 1962, so I suppose I would have had to try diving. If you decide to dive, I recommend the warmer water of the summer months. Or, you can even see some of the shallower wrecks from a kayak, though you probably would have used a canoe in 1962. Even small things like what kind of boats we use have changed over the years. People knew of kayaks in 1962; I learned about them in school as something used by the Eskimos. But somehow the rest of us actually discovered how useful they were, and now you find kayaks almost anywhere there is water. And, just in case you didn't see enough lighthouses today, Alpena has another! A small light on steel legs is out on the breakwater. The Alpena Light is sometimes called "Sputnik" because it resembles a satellite. It is not open to the public, but a light has been on the point since 1877. To get a view of it, turn east on 1st Avenue in downtown Alpena and continue two blocks to the Thunder Bay River. Park wherever you can find a parking space, and walk to the riverfront. The light can be seen to the South, at the mouth of the river. There are also two lighthouses out on islands in Thunder Bay. The Thunder Bay Island Lighthouse is on its namesake island. At one time there were 160 people living as squatters in a large fishing community on federal land. The other is the Middle Island Lighthouse, which is now open as a resort lodge, but was a working lighthouse in 1962. Alpena loves its lighthouses, and hosts the Great Lakes Lighthouse Festival in October! 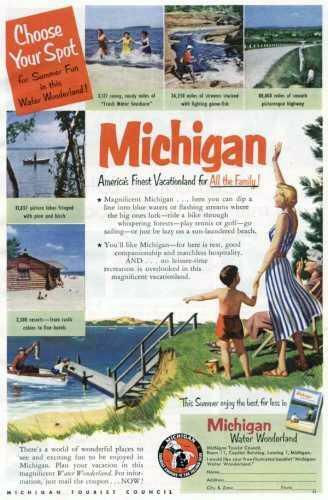 Unfortunately, one of the sights Alpena has to offer did not exist in 1962, so we won't be stopping in. The Jesse Besser Museum was not opened until 1966. But if you want to "cheat" by a few years, the museum has several good collections covering Native Americans, art, local history, and even a planetarium. We will find another planetarium on this trip though, that did exist in 1962, and maybe we'll see a show. Anyway, it's time for lunch, so let's drive around town a bit to see what looks old. I remember eating at Lud's when I was younger, but it's closed now. We would have had to cheat to eat there anyway, as Lud's was established in 1964. It was the first fast food restaurant in Alpena, and just closed a couple of years ago. Too bad for us, because it really looked the part of early 1960s burger drive-ins. Here on the south side of town I found Nick & Ivy's Country Diner. It's an authentic 1950s Diner that was totally refurbished in 1996 but still bears an "Al's Diner" lighted sign on top. Originally built by the Jerry O'Mahony Co. in 1955, the phone number commemorates the date (517-358-1955). According to Roadside Architecture, in 1962 it was still located in Wilkes-Barre, Pennsylvania, but wherever it was, it's a delicious place for lunch. We begin a short trip along Lake Huron again, which you can just barely see between the cottages. Michigan's lakeshores are largely privately owned, as you have no doubt noticed by now. Many times we can drive within 150 feet of the shore but not see the lake. Somewhat sad for the motoring public, but if you own one of these cottages, you have great sunrise views. About three miles south of town we pass an unusual marker: the 45th Parallel. This is the line around the earth that marks halfway between the North Pole and the Equator. This line marks some of the northern boundary of Vermont and most of the boundary between Montana and Wyoming, where you can find a sign marking it in Yellowstone National Park. It also passes through Rishiri-Rebun-Sarobetsu National Park in Japan, cuts through the Aral Sea in Kazakhstan, and runs through northern Italy, just south of Turin. A ROADTRIP-'62 ™ factoid: there is NO single US-numbered highway that stays close to the 45th Parallel across the entire country. Parts of 10 different routes are occasionally near the line, but seldom on it. About 10 miles south of Alpena, we reach today's great old-fashioned road attraction: Dinosaur Gardens! It's just north of the small town of Ossineke, Michigan and was built by Paul N. Domke, Sr. Twenty-six hand-sculpted prehistoric animals are set in clearings, spread out over 40 acres. The construction of the park started in the late 1930s, and in addition to the dinosaurs, there is giant concrete Christ that greets visitors at the entrance. You can climb stairs right into some of the sculptures! Part of the site is a swamp, so bring OFF! or some similar insect repellant in the summer. Dinosaur Gardens's gift shop boasts "Everything dinosaur! ", so you can really stock up on tacky gifts. And, you can play some miniature golf: this place has everything! The highway swings back inland for the next 20 miles, and that's why the next state park is too far away for us. Negwegon State Park is just over 5 miles away, and the roads are primitive, sandy, and recommended for 4-wheel drive vehicles on some days. I've been out there once and it is the most deserted state park I've ever seen. Miles of quiet hiking and a nice beach though. Something closer to the road is yet another lighthouse, and it may be the last on this trip. 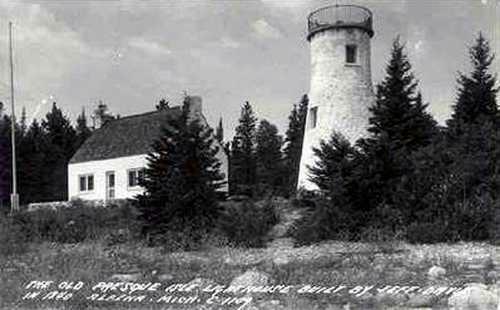 The Sturgeon Point Lighthouse is just north of Harrisville, Michigan and has been here since 1869. It's still in use as a lighthouse, to mark a reef that extends about 1-1/2 miles out into Lake Huron. It's also now a museum, but only since about 1982, so we won't visit that. However, if you just want to stop and admire the lighthouse and the scenic vistas of Lake Huron, you could do that in 1962. You can also cruise the lake for sportfishing, either in your own boat or with one of several charter services out of Harrisville. As the fishing has always been here, I suspect you could have chartered a boat back in 1962 also. So if you love fishing, give it a try here. When we finally return to the lake it's at Harrisville, Michigan. Let's go hunting for a little piece of 1962 today. Daisys Antiques Gifts & Fudge or Kenneth Roy Antiques are both downtown and either one looks like just the place for us. Wandering around in an antique shop is often a good way to find what you're looking for, although sometimes a dealer can point you to a 1962 artifact. There's lots of toys around, some magazines or comics, sometimes an item of kitchenware or glassware; let your imagination go. Today I picked up a 1962 issue of Look Magazine with an article about former President Dwight Eisenhower, and his golf game. I get the impression that the country was obsessed with the President's golf game and not too concerned with his policies. Kind of refreshing after the daily attacks on politicians that passes for news today. Harrisville State Park, at the south edge of town, is a small state park but it has a very nice beach. Established in 1921, it is one of Michigan's oldest state parks, and was originally even smaller, at only six acres. That would hardly make a good city park today. The Cedar Run hiking trail wanders through a nice cedar swamp and even connects to Harrisville streets if you want to walk to town. It's a fun way to burn a little energy. Leaving Harrisville State Park, we’ll continue south along Lake Huron. You know, you really can't tell the difference between one of these Great Lakes and an ocean without close inspection. One difference is that the lakes have no tides. So you don't find all the sea life of tide pools. You do find rocky beaches sometimes, but mostly sandy beaches. And, there's usually no surf unless the day is very windy. As I mentioned yesterday, most of the coast is private cottages, so don't miss any opportunity to stop and see the beach. We're stopping at a roadside park just north of Oscoda that has about 1/2 mile of very nice beach. Get out and walk it and enjoy the waves, no matter how small they may be today. The activities at Oscoda, Michigan center on the Au Sable River, which was once a main transportation route for lumber. The logs came down to Oscoda's mills each spring, and boats traveled up and down the river for commerce. Today, one of the main activities is also one of the oldest: canoeing. Just like the Native Americans hundreds of years ago, you can canoe down the river. There are canoe liveries all the way up the river to Grayling, and you can canoe anything from a 2-1/2 hour trip to several days running all the way down to the mouth at Oscoda. You will have to portage several hydroelectric dams along the way if you travel the entire length. There is even an annual canoe race in July, for the seasoned canoeist. The 64th Annual Weyerhaeuser AuSable Canoe Marathon was held in 2011, so we could have seen it or participated in the race in 1962. It begins at dusk upriver in Grayling and ends 120 miles and 14 non-stop hours later, right here in Oscoda! It is the world's longest non-stop canoe race. I've never canoed the lower reaches of the Au Sable River, and never been in a race, but I have canoed the beginnings of the river near Grayling. That portion is beautiful, even though it is the busiest river in the state. I won't stop here because I'll be canoeing a different river tomorrow, and take one more hike tonight after dinner. Back in 1962 you would hear the frequent sonic booms of jet bombers and fighter planes coming and going from the former Wurtsmith Airforce Base. Even living 75 miles away when I was a kid, I heard them frequently. It began as a small landing field, but in 1960 the Strategic Air Command (SAC) took over the base and brought in the 379th Bombardment Wing flying the KC-135A Stratotanker and the then brand new B-52H Stratofortress. During the years of the Cold War, the Air Force kept constant watch over the Canadian border and the entire northern part of North America from bases like this. There was always concern the Soviets might launch a missile attack from over the Arctic Circle. The base closed in 1993, with several private companies now operating other businesses on the site and part used as the local airport. The Yankee Air Force also has a plane museum here, and though the museum was not here in 1962, some of the planes are of that vintage. So even though the sonic booms are now gone, the planes live on and this is another spot worth seeing on our tour of history. For the adventuresome who want to leave US-23, the Michigan Shore-to-Shore Trail begins here at Oscoda, and runs west 220 miles across the state to Lake Michigan. It's the longest continuous trail in the Lower Peninsula. It's a combined hiking and horse trail and was first laid out in the early 1960s, so we could have hiked it in 1962. The trail was completed the next year, with the first ride of the Michigan Trail Riders Association occuring in 1963. Much of the trail is through the Huron-Manistee National Forest, which we'll also drive through a bit of tomorrow. And speaking of forests, how about the legendary lumberjack Paul Bunyan? In 1906 the first printed story about him was written by Oscoda Press writer James MacGillivray, so find a good Paul Bunyan book, maybe at Great Northern Bookstore, and read it at the motel tonight. As we drive around town, don't forget to look for the huge Paul Bunyan statue in front of Furtaw Field (also known as Paul Bunyan Park). Only problem I have is that I don't know when it was built. I'm off to try some of the hiking now, along the beginning of the Shore-to-Shore Trail. Another good bet for hiking is the Eagle Run trails of the Huron-Manistee National Forest, located at a new visitor center about 2-1/2 miles west of town. The Eagle Run trails afford great views of the Au Sable River valley, but the visit the center is newer and the trail system probably is too. Well, I'm back from the Michigan Shore-to-Shore Trail and my last hike of the day and I'm motel-hunting. Oscoda has somehow managed to retain over a dozen older motels, so we have good choices tonight. We'll see later in the trip that motels from 1962 in good condition are hard to find 50 years later! Many of these are little cottages, which probably go even back further than 1962. Most of these have been remodeled inside and out. I'm looking for one on the shore, to see a sunrise tomorrow on this Sunrise Side of Michigan. As a bonus, some, like the Aurora Resort Motel or Sandcastles, allow campfires on the beach at night. Some folks say the rooms at the Aurora still look like they were decorated in the 1960s, though that could be either good or bad. There are also some inland motels like the Aspen Motor Inn. I'm going to slice some of that sausage I bought yesterday at Plath's, sit on the beach, and listen to music on my old transisitor radio. "Stranger On The Shore" by Mr. Acker Bilk will be just the right song from 1962 for the evening: mellow and romantic by the shore, watching that campfire. See you tomorrow for more Roadtrip-'62 ™ fun!